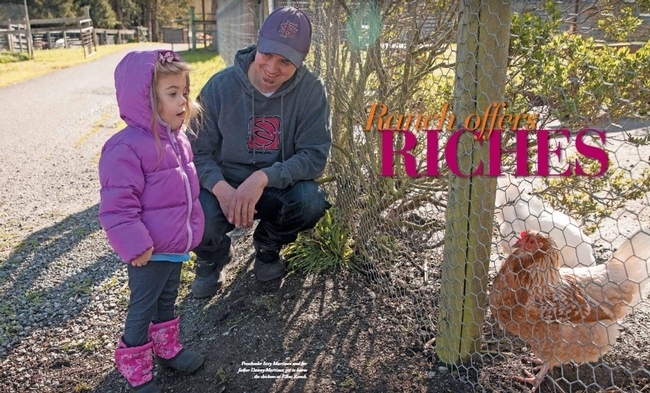 Each year, about 9,000 kids visit the UC Agriculture and Natural Resources Elkus Ranch in Half Moon Bay for hands-on educational experiences in urban horticulture, nutrition, food safety, pest management, livestock management and food preservation, reported Sara Hayden in April 2018 issue of Half Moon Bay Magazine (the article begins on p. 16). Hayden visited the ranch with photographer Jaime Soja when a group of preschoolers descended to explore the garden and meet the farm animals. "They can taste and touch and smell things - feel the wool of a sheep or an egg, know where their food is from, where the clothing fiber comes from," said Kathi Baxter, UC Cooperative Extension environmental science educator at Elkus Ranch. "Ideally, kids would get the idea that space is necessary to grow food. We're hoping to plant that seed of stewardship here." The Elkus family donated the 125-acre ranch in the 1970s as a gift for youth. The ranch's operating budget depends heavily on grants and donations. For more, visit the Elkus Ranch website at http://ucanr.edu/sites/elkus_ranch. UC ANR's Elkus Ranch welcomes about 9,000 kids each year for a hands-on, outdoor learning experience.